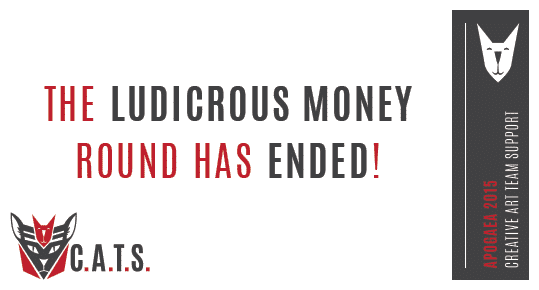 The Ludicrous Money Round has come to an end! The GOOD NEWS is we received 27 proposals for mind-blowing art!! The BAD NEWS is we had requests for almost 4.6 times the amount of money we had to give out and had to make 21 people really, really sad. 1. Animal Farm – The “Animal Farm” that I hope to bring to Apogaea will be set in the final rebellion stage after the story left off, when the animals have risen again to fight their Pig/Human hybrid overlords. What is left is a dystopian war zone, as the Pigs attempted to destroy all instead of allow the animals to control it again. This space is the final space left for the animals to express themselves freely, where they have gathered the last cultural items they have protected from the pigs plundering and destruction. The area will be a large sculpture garden consisting of the improved projects we have built previously including Prima Materia, and Arcus Hymenoptera, along with a new Angler fish burn barrel, stages for performances, and benches and a fire entrance sign. We will also open the space up to other artists that want include animal based fire art, and already have one or 2 other burn barrels in the works by other artists. >>See www.facebook.com/arcushymenoptera and www.facebook.com/primamateriaalchemy for more information. 2. Church of Prometheus – Prometheus is the Greek god who stole fire from Mt. Olympus and brought it down to humanity. For this, he was punished by Zeus by being chained to a mountainside for eternity. The fire he gave us also represents life’s intensity: creativity, passion, soul. As Burners, these are all things we “worship.” This installation will create a place to worship–a full-blown church of Prometheus, though somewhat of a caricature. >>See www.facebook.com/ChurchOfPrometheus for more information. 3. Jedi Fire Simon – Jedi Fire Simon (JFS) is a twist on the electronic interactive Simon game from 1978. JFS will be identical to the original game, where a player has to repeat a series of button presses determined at random by the device. Much like the original, the JFS device will have four colored (or illuminated) buttons. Each button will produce a corresponding individualized tone, color, and fire when pressed. Fire will come from one of 4-1” discharge cannons located in the corners of the game play field. Additionally, fire will come from a fifth fire cannon, 2” discharge, located above the game control board will produce a massive (+70’) flame effect when a player successfully completes a set number of turns or rounds. >>See https://www.facebook.com/groups/684691554940776/ for more information. 4. Temple of resonance – Temple of resonance (working title) is a three-dimensional mandala installation. The primary components of the Mandela are five Tibetan inspired bell towers. The largest and central tower measures in at 13 ft and is surrounded by four 10-foot tall towers of the same design. Each bell will be made from recycled gas containers and will create piece of a five part major chord when played together. In between each 10 foot tower there will be corner shaped communal bench. Providing a place for connection, contemplation and laughter. Surrounding all of this will be twelve 2-foot tall pagodas placed in a ring defining the perimeter of the temple Mandela. >>See https://drive.google.com/a/apogaea.com/folderview?id=0B0yYj13b9riuMWVURXZVdXM5OVU for more information. 5. The Fountain – The Fountain is a large-scale 360-degree installation that celebrates light, water, audio, and amazing reactivity. The base of the structure consists of metal framing with semi-translucent laser-cut panels between. Within the structure, full-color high-frame rate LED washes and strips slowly animate and give the base an unearthly glow. The base conceals a small sound system that plays ambient tones and patterns that murmur along with the lights. >>See http://audiopixel.com/the-fountain for more information. 6. To be determined – This will be a free-standing, interactive steel sculpture that incorporates lighting effects and fog. The piece will have a 4-sided pyramid base about 4 ft high, with perforated designed flat steel surfaces that allows both lights and fog through hand drilled holes in the flat steel sides of the pyramid. The base will be 8 ft long on each of the 4 sides, slightly longer than the rotating stars it supports for stability. The sculpture’s main feature are three, 3 dimensional stars, one inside the other, descending in size. They rotate on their center axis independent of one another. By pushing the large outer star, people can interact with the piece by controlling its speed and direction. The outer star directly drives the axle the other two stars sit on, but the other two smaller ones are on thrust bearings and pushed by the friction their weight creates but can still spin freely at different speeds. Sometimes the stars are out of sync, creating different shapes within one another; sometimes they line up and spin as perfect synchronized stars. >>See https://docs.google.com/a/apogaea.com/file/d/0B5tacCguygdtTjZ0NzdjVHhzVTg/edit for more information.